Goniurosaurus range from a shades of brown and black but some species like G. bawanglingensis retain a more reddish-orange hue. They have yellow or orange bands with darker spots. 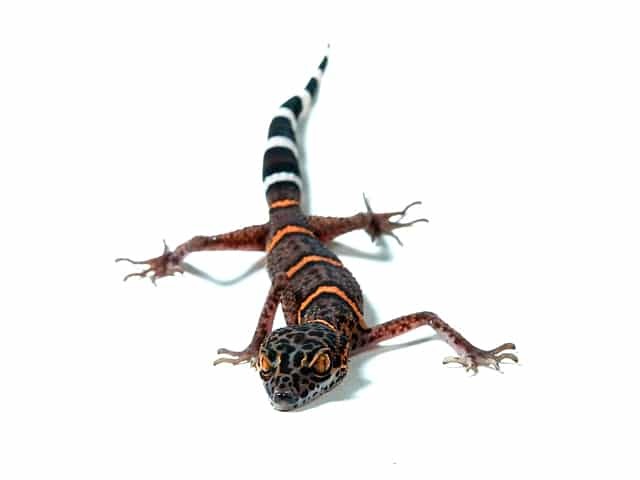 There are 17 subspecies of cave geckos with species still being discovered. The most common in the pet trade are G. araneus, G. hainanensis and G. Lichtenfelderi from Vietnam and the G. Luii from China (pictured). Goniurosaurus tails will not get ‘fat’, but a nice lean tail is the sign of a hardy animal. Depending on the species, the number of bands and the thickness of the bands will vary. Goniurosaurus is broken into several clusters, or groups, of species. These groups also effectively cluster care requirements. The luii group, comprised of G. luii, G. araneus, G. bawanglingensis, G. huuliensis, and G. yingdeensis all tend to fare slightly larger, thus requiring a bit more space. Meanwhile, the lichtenfelderi group (G. hainanensis and G. lichtenfelderi) and kuroiwae group (G. kuroiwae, G. orientalis, G. yamashinae, G. toyamai, and G. splendens) remain fairly small. Animals of the luii group should obviously be housed in larger enclosures, and often with slightly more height, whereas animals of the lichtenfelderii and kuroiwae group can be housed in similar sized enclosures. Suggested enclosure dimensions are at least 0.6 x 0.45 x 0.6 meters (2 x 1.5 x 2 feet) (LxWxH) for an individual or small group (1.1 or 1.2) of larger species, and an 0.45 meters (1.5 feet) cube for a small group of smaller species. However, keep in mind that larger and densely decorated enclosures will be utilized, and surface area, intricate cover, and humidity are the priorities when planning enclosures for this genus. Being that this genus is comprised of cool-temperature species, their keeping is rather appealing, given they don’t require excess heat, and are largely terrestrial- though they will climb if given the opportunity. Their entire enclosure as mentioned in the housing topic should effectively be a network of hides. Substrates used for Goniurosaurus can be largely variable, depending on what the keeper is familiar with, and has on hand. But no matter the choice, it should be something that retains moisture well, to help maintain humidity. Some mosses, bark choices, and soil mixes are ideal for this. Many also will utilize the option of adding clean-up crews of assorted isopods and springtails to help keep the enclosure clean and well maintained. Given the high moisture levels in these vivaria, remember to add a drainage layer below your substrate layer, to help prevent over-retention of moisture in the soil, which can lead to undesired bacterial and fungal growth. Given that Goniurosaurus are crepuscular/nocturnal, lighting isn’t a detrimental factor to their husbandry. Though a proper photoperiod should be applied, be it by ambient room lighting, or over the enclosure. Since many keepers choose to utilize clean-up crews and live plants (to help maintain humidity, and overall aesthetics of the enclosure), many also apply lighting to the enclosure to allow for proper plant growth. Even though they’re rarely out in the day, they will benefit from UVB exposure. If this is not provided, then supplementation with Vitamin D3 will be required to help ensure the animal(s) can process calcium efficiently. Temperatures should range between 18-25 °C (65-78 °F), but should not exceed the 26 °C (80 °F) mark for prolonged periods. Night temperature drops of several degrees also help maintain a natural cycle to the animal, as do seasonal temperature shifts. They tend to drink best when lapping water from décor/plants/walls of the enclosure after a misting. I simply mist them nightly to maintain humidity, and keep curled leaf litter, which water pools on, and they lap it up from there, off the walls, and off the rocks. Humidity should range between roughly 60-85%, with peaks and valleys to provide more water, and allow drying periods, respectively. For many keepers, periods of spraying to add humidity also serve as the drinking water for the animals, as they’ll lap up water from the plants, décor, and sides of the enclosure. Feeding is typically a twice weekly event for Goniurosaurus in our collection. Given we house ours in pairs or trios, we often dust a fair number of crickets with calcium & vitamin supplements and put typically around 20-30 per enclosure. Once or twice a month, we also offer dubia in feeding bowls, and also leave small mealworms constantly available in feeding bowls. They don’t eat the mealworms often, but they do pick at them occasionally. We also leave a small dish of supplements for them to lick up, which is often replenished due to humidity causing it to coagulate, often leading to rapid molding, as well. Goniurosaurus sp. are very secretive animals. They will be out and active in the depths of the night. They will often dart to cover when startled or to new cover when they’re disturbed while under cover. They aren’t great as a pet to handle, but are great as a pet to observe. There are individuals that certainly tolerate handling, but it should not be an expectation when getting into the genus. 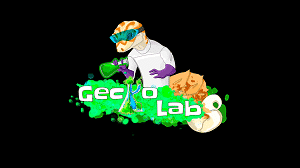 Cleaning should be on par with any other terrestrial geckos- spot clean as needed, and give a deeper clean about every month or so. Given that many do keep Goniurosaurus sp. in enclosures bordering on bioactive, cleaning is far less frequent, as the clean-up crews will take care of most fecals, shed fragments, etc. Shedding is something you probably won’t witness often, if at all. Given the genus is rather secretive to begin with, and shedding is a time of higher vulnerability, they tend to remain in hiding for the several hours surrounding when they are deep in shed, until they are finished removing it. Like other Eublepharidae, Goniurosaurus sp. will eat their shed. This serves as a means of recycling the nutrients, and in the wild serves as a way to decrease the ‘trial’ they leave to avoid being tracked by predators. Common Health Problems with Goniurosaurus sp. are those found in any other Eublepharidae- egg binding, parasitic or bacterial infections, etc. But the issues that seem most common are lack of eating and dehydration. More often than not, the two issues are related, with the humidity levels being too low for prolonged periods, causing dehydration and consequently a lack of appetite.